Another year added, another year to cherish and to be thankful for. Sometimes I forget just how lucky I am.. No, lucky isn't the right word. I am blessed. I'm very happy to be blessed with awesome people in my life. Life is good and God is great! Yesterday I turned 25, and my Facebook wall was flooded with lots of Birthday wishes from families, friends and online friends even some of them I don't know and haven't met personally which is overwhelming. Birthday wishes started coming as soon as the clock struck 12mn and I was still awake at that time. In fact I already slept past 3 then woke up around 5am when Jaear arrived home from work. Jaear didn't sleep right away so I took advantage of it and slept some more while he looked after the kids. I overslept and woke up 12nn already, still feeling sleepy and exhausted but cooked something easy for lunch. But J fell fast asleep so it was just me and the kids who ate lunch. He woke up later that afternoon then immediately prepared and left for work. 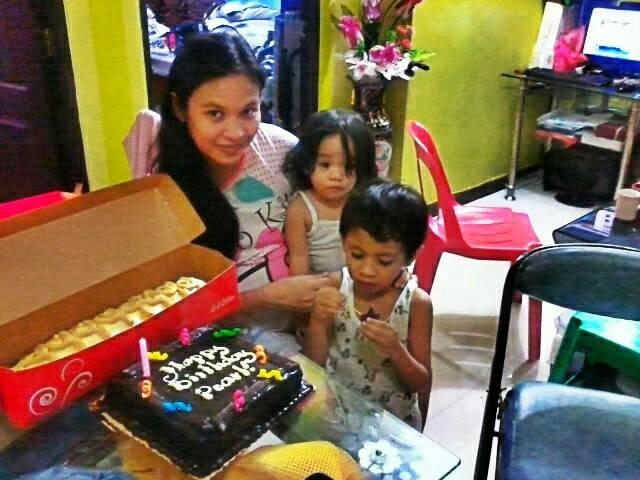 So we didn't get the chance to celebrate my birthday, it felt just like an ordinary day except that I am getting lots of birthday wishes. But before J left for work, I planned on cooking spaghetti so he could eat before leaving but he's already in a hurry. Then my in laws called and told me not to cook anymore as they will be taking home some foods. 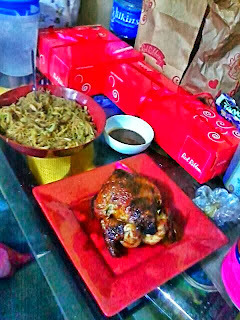 and a whole lechon manok/roasted chicken. Incomplete, wish you were here. 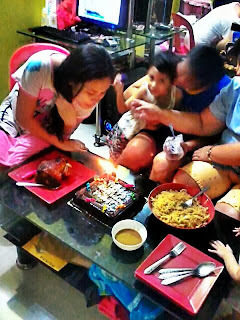 After singing "Happy Birthday" blowing of the candle! Just when I thought my day would end up like any other ordinary day, it turned out to be a special one. Thanks to my in laws who made it possible, indeed I have lots of amazing people in my life. Just too bad Jaear's not around to celebrate with us and also times like this I miss home, my family back in the province whom I used to celebrate with. Actually my parents did celebrate my birthday too, my mom also cooked pancit for me, thoughtful no? Even though my birthday isn't a grand celebration, in fact it was just very simple what's important is that for me it's special, though I'm not with some of the important people in my life physically I'm already thankful that they took some time to wish me the best on my special day and for making me feel that they are just there for me, even just virtually. I almost forgot about this. Here's what Jaear got for me, he knows me so well! 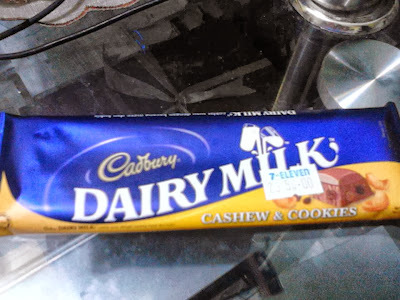 And Yes, I intentionally did not remove the price tag, where else can you buy chocolate during dawn? 7-11! Here's another long overdue post. Just a quick post about some happenings 2 weeks ago, my mother in laws birthday celebration. October 6, first Sunday of the month and my mom in laws birthday. 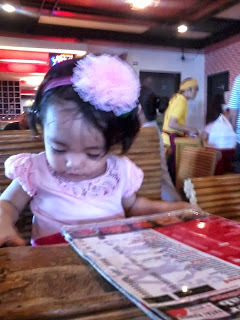 We decided to have her birthday lunch at Yakimix SM Mall of Asia branch. But again we left home late, so when we arrived at Yakimix around 1pm there was a very long queue already. There were 16 people on the list which made us on the 17th spot, so that's a long wait. Their lunch buffet closes at 2:15pm, considering the long queue, the time, and that we are all so hungry we decided to eat somewhere else. We decided to have seafood so we drove straight to Seaside Macapagal or Dampa, they have "Paluto" wherein you get to to buy fresh seafood from the market and have it cooked at any restaurant of your choice. My in laws chose to have our "Paluto" at Yatai Ramen, they've been here before already as for me it's my first time. I've been to Dampa 2 times before but to different restaurants. As soon as we arrived we were seated right away, since it's already past lunch time the place isn't that crowded. It aint complete without photos taken. My in laws, happy birthday Ma! It took a while before the food was served, which made us even more hungry.But of course again, we wont miss taking a good shot of the foods before eating 'em! After eating, we went straight to SM City Manila to avail the 3,000 voucher I won from Mendrez Shoes and Bags Facebook Giveaway. I decided to use it to buy a gift for my mother in law, and we are just right on time because they were having a Sale so instead of just 1, I was still able to buy for myself. My mom in law chose this bag because it matches her uniform. These 2 bags are originally priced at 1,999 each but with the 20% discount we only got it for 1,599.20. So it's 9,198.40 in total but we only paid P198.40 for the 2 bags since we used the 3,000 voucher. 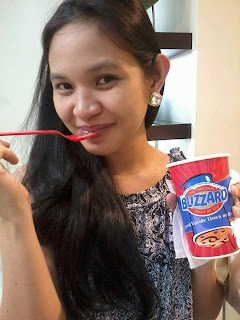 Afterwards, we drove back to Las Pinas but Jaear and I went straight to SM Center Las Pinas. Because a day before Sunday, I got lucky once more for winning 1,000 Shopping Gift Certificate from SM which I can only claim unitl Sunday and we used it right away since we are already running out of stash and pay day is still a week after. At home my mom in laws birthday cake which was bought by my sister in law awaits us. In fact it's the only thing I had for dinner, because I' still full from what we had for lunch. So that's it, a fun Sunday it is with family. I also feel blessed that I am able to share with others my winnings from being an online contest fanatic. Being a full time mom who doesn't have a source of income somehow I am still able to contribute, even in small ways. Imagine aside from getting free stuff for me, I am able to share it to others. Isn't it cool? I can't believe it, I'm already on my 34th week of pregnancy, 6 more weeks or less I will be having our third bundle of joy! I posted an update during my 31st week however this past weeks had been busy that's why I wan't able to post any blog entry. Also my baby girl is kind of having an issue whenever I'm in front of the computer (papansin hehe) which I find sweet. By the way, after my prenatal check up last September 13 I was supposed to go back on the 27th but I wan't able to go that day. I had it postponed for a week due to time conflict. Jaear just started out with his new job and had a lot of things to accomplish that week. So I was able to visit my OB last last week October 4. I had my shot of Tetanus Toxoid and my OB checked on my unborn baby. The heart beat was normal, but still my baby hasn't turned to Cephalic presentation which is ideal for a normal delivery. So it's still hard to determine the gender. My OB also gave me a heads up that if my baby wont turn before my expected delivery, I might undergo a Cesarean Section. Decreased risk of maternal hemorrhage, blood clots, and damage to internal organs. Decrease risk of illnesses for my baby. As a nurse I do have knowledge about this and I also made some researches already. Both have their Pro's and Con's but I still prefer to give birth the natural way. My next visit to my OB is on the 18th right after my birthday. We will be repeating the ultrasound once more to check my unborn baby's position, hopefully by that time he/she's already on Cephalic.But based on my readings, at this point my baby doesn't have enough room to maneuver inside my womb because his bigger now. But I'm still putting my hope up,well I am also eager to know the gender, I really haven't picked out a baby name yet haha!